We are committed to best practices for the benefit of our farmer-members, and for the air, soil and water. Several significant financial investments have been made on behalf of our farmer-members. 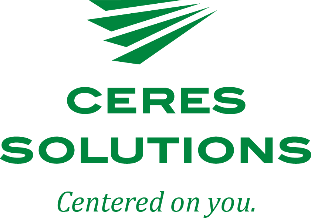 Thank you for your business and continued support of Ceres Solutions Cooperative. That's 4-H Foundation's Shelly Bingle with Jeff Troike pictured. Hundreds of growers participated in the recent Bayer and BASF Dicamba Meetings in our trade area. We were pleased to serve as host for these educational events! "I love my job. I'm given every opportunity to build success." Clark Warner, a four-year member of our Energy Sales Force credits the experiences, autonomy and progressive environment for his career satisfaction. Are you interested in viewing your year-end statement or other financial records online? It's time for you to take advantage of our system that allows you to view your bill online and pay online. Click below for more details, to pay your bill or simply learn more.